Stem cell therapy may offer retina specialists a new avenue for regenerating damaged tissue in the back of the eye. • The eye is especially well suited for stem cell therapy. • There are two approaches to stem cell therapy: cell replacement therapy and regenerative therapy. The latter option may be best suited for ophthalmic indications. • Cell therapy targeting restoration of retinal pigment epithelial cells may one day treat diseases such as myopic macular degeneration, Stargardt disease, and age-related macular degeneration. There is an old adage that says “If ain’t broke, don’t fix it.” But what happens when it is broken, and there are no replacement parts available? Degenerative retinal diseases are a leading cause of irreversible blindness and debilitating loss of visual function. For patients experiencing conditions secondary to pathologic loss of retinal tissue, the best that can be hoped for with current therapies is to delay disease progression. However, hope for a true breakthrough is on the horizon. 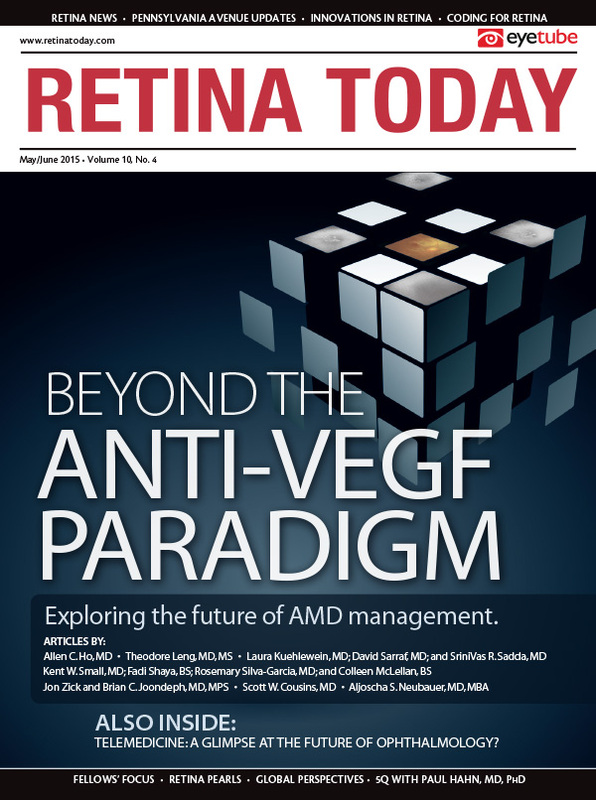 A previous installment of this column (“Gene Therapy for Retinal Diseases,” Retina Today, April 2015, page 24) offered a primer on gene therapy and discussed novel therapies employing genetic technologies being studied in clinical trials. This installment focuses on another option for restorative treatment of degenerative retinal diseases: stem cell therapy. The retina presents an attractive target for stem cell therapies for many reasons. The eye is easily accessible,1 and novel surgical approaches allow the transplantation of cells to targeted locations in the back of the eye.2 Although the eye is structurally complex, the number of different cell types it contains is low, and so retinal stem cell therapies can be targeted to replace a single cell type, such as pigmented epithelial cells, ganglion cells, or photoreceptors. Because the eye is a relatively small organ, the number of stem cells required for a procedure would theoretically be lower than with larger organs. After stem cells are delivered to the site of a disease pathology, the immune-privileged nature of the eye minimizes the risk of tissue rejection, which is a major concern for transplanted cells in other organs.1 Additionally, the numerous tools available to measure ocular structure and function allow continual assessment and monitoring of stem cell function. These advantages have put retinal disorders at the forefront of stem cell–based clinical research. A crucial issue in stem cell therapy concerns the source of harvest for human stem cells. The earliest attempts employed cells from fertilized embryos. The significant ethical considerations regarding use of human embryos for therapeutic applications, however, have led researchers to explore other potential sources.2,3 One of these alternatives involves treating adult somatic cells with mixtures of growth modifiers and transcription factors to create stem cells; these induced pluripotent stem cells (iPSCs) can then be used as source material for directed development into the desired tissue type. Use of adult stem cells is another option; these are undifferentiated cells found in specialized tissues such as bone marrow, tooth pulp, and the corneal limbus. The human body maintains a library of differentiated stem cells for the repair or replacement of damaged cells or tissue; however, adult stem cells can be directed to alternative developmental pathways and used to replace tissue types other than those for which they were intended. Methods have also been developed to generate parthenogentic stem cells via manipulated activation of unfertilized oocytes or oocytes that have undergone somatic cell nuclear transfer.4 The goal of this approach is to create immunologically matched tissue banks of stem cells for general use. It is important to note that although generation of stem cells by any of these methods is conceptually simple, the logistics of the procedures are complex and remain a significant hurdle to routine stem cell therapy. Retinal diseases that result in progressive loss of neural cells (eg, photoreceptors, interneurons, or retinal ganglion cells) or essential supporting cells such as retinal pigment epithelium (RPE) cells are potential targets for stem cell–based therapies.5 Initial efforts have focused on RPE cells because they do not require synaptic reconnection but still play an important role in many degenerative conditions.6 RPE cells play a key role in the maintenance of healthy photoreceptors, and in some diseases, the pathologic loss of RPE cells leads to loss of rods and/or cones. Transplantation of human embryonic stem cells that have been differentiated in vitro into RPE cells is an approach currently undergoing clinical trials in myopic macular degeneration, Stargardt disease, and age-related macular degeneration.2,7 Photoreceptors represent an interesting option for stem cell therapy among neuronal retinal cells because they send synaptic signals in one direction only, making the transplantation of these cells less complex than that of other neuronal cells.2,8 There is also interest in using autologous bone marrow–derived stem cells to treat ganglion cell loss associated with glaucoma, as has been demonstrated in both basic research9 and early clinical trials (NCT02330978). Regenerative medicine is designed to provide solutions to diseases that our own bodies cannot repair.8 Cell replacement therapy is one of several (and perhaps the best known) therapeutic applications for stem cells.2,8,10 During cell replacement therapy, differentiated cells replace the damaged resident cells to restore function. An alternative method is rescue therapy via a regenerative approach, also known as the paracrine effect.2 In this approach, transplanted stem cells secrete trophic factors, such as ciliary neurotrophic factor (CNTF), that have demonstrated effects on neuronal cell survival. The CNTF-secreting cells are thought to induce the resident tissue to proliferate and self-restore in a way that mimics the normal developmental process. Although there has been enormous progress in treatment options for retinal diseases in recent years, visual loss still occurs for many patients.3 A number of stem cell–targeted clinical trials are under way to treat a variety of retinal conditions. The recent progress in regenerative medicine portends good things to come for patients with degenerative retinal diseases. The high number of programs in clinical trials has carried forward momentum for stem cell therapy. Aron Shaprio is vice president of retina at Ora in Andover, Massachusetts. 1. Perez VL, Saeed AM, Tan Y, et al. The eye: a window to the soul of the immune system. J Autoimmun. 2013;45:7-14. 2. Tibbetts MD, Samuel MA, Chang TS, Ho AC. Stem cell therapy for retinal disease. Curr Opin Ophthalmol. 2012;23(3):226-234. 3. Ong JM, da Cruz L. A review and update on the current status of stem cell therapy and the retina. Br Med Bull. 2012;102:133-146. 4. Daughtry B, Mitalipov S. Concise review: parthenote stem cells for regenerative medicine: genetic, epigenetic, and developmental features. Stem Cells Transl Med. 2014;3(3):290-298. 5. Siqueira RC. Stem cell therapy for retinal diseases: update. Stem Cell Res Ther. 2011;2(6):50. 6. Park UC, Cho MS, Park JH, et al. Subretinal transplantation of putative retinal pigment epithelial cells derived from human embryonic stem cells in rat retinal degeneration model. Clin Exp Reprod Med. 2011;38(4):216-221. 7. Baker PS, Brown GC. Stem-cell therapy in retinal disease. Curr Opin Ophthalmol. 2009;20(3):175-181. 8. Huang Y, Enzmann V, Ildstad ST. Stem cell-based therapeutic applications in retinal degenerative diseases. Stem Cell Rev. 2011;7(2):434-445. 9. Sun Y, Williams A, Waisbourd M, et al. Stem cell therapy for glaucoma: science or snake oil? Surv Ophthalmol. 2015;60(2):93-105. 10. Hyde DR, Reh TA. The past, present, and future of retinal regeneration. Exp Eye Res. 2014;123:105-106. 11. Haq W, Arango-Gonzalez B, Zrenner E, et al. Synaptic remodeling generates synchronous oscillations in the degenerated outer mouse retina. Front Neural Circuits. 2014;8:108. 12. Casaroli-Marano RP, Zarbin A. Cell-based therapy for retinal degenerative disease: preface. Dev Ophthalmol. 2015;53:xi-xii.